His exit ends a tumultuous tenure in the West Wing that was riven with internal tension and constant questions about his future. White House chief of staff John Kelly will leave his position by the end of this year, President Donald Trump confirmed Saturday, ending a tumultuous tenure in the West Wing that was riven with internal tension and constant questions about his future. “He’s a great guy,” Trump told reporters of the retired Marine general, according to a pool report. He said as he departed the White House that a replacement would be named in the next few days. POLITICO and other news outlets reported Friday that Kelly’s resignation was imminent and that White House officials were trying to find a way to transition him out of his role. Nick Ayers, Vice President Mike Pence’s chief of staff, is the leading candidate to replace Kelly. But Ayers’ ascension has not yet been finalized. Trump and Ayers, who have repeatedly discussed the role in recent weeks, are still negotiating the terms of Ayers’ service, including how long he’ll commit to stay in the job, according to a White House official. The president wants Ayers to remain in the position through the 2020 election, but Ayers, who has young children, has told associates that he hopes to eventually move back to Georgia. Another White House official said Trump and Kelly spoke Friday night about Kelly’s departure, adding that the president is planning to announce his next chief of staff on Monday. Kelly had previously said he planned to stay on as chief of staff through the 2020 election, but few in the West Wing believed he would last that long. By Friday, senior administration officials said privately that Kelly’s departure was a certainty, noting that his relationship with Trump had reached a low point. The president has praised Ayers to aides in recent weeks, and he even informally offered him the job during an election night reception at the White House. Trump’s advisers have encouraged him to choose a more politically savvy chief of staff than Kelly as his team gears up for his 2020 reelection campaign. The two men had been in something of a stand-off in recent weeks. Trump was reluctant to directly fire Kelly and he was advised by some of his aides that pushing out a four-star general could result in political blowback, administration officials said. Meanwhile, Kelly made it clear that he had no plans to resign, leaving it up to the president to force him out. In the end, Trump’s announcement came like so many other personnel changes — in a brief remark to reporters instead of a formal announcement from the White House. Trump’s disdain for Kelly reached a boiling point during the president’s recent trip to Paris, when the White House’s decision to skip a planned trip to a cemetery for American soldiers because of bad weather overshadowed the rest of the swing through France. Aides said the president was furious about the blowback he received and heaped much of the blame on Kelly. 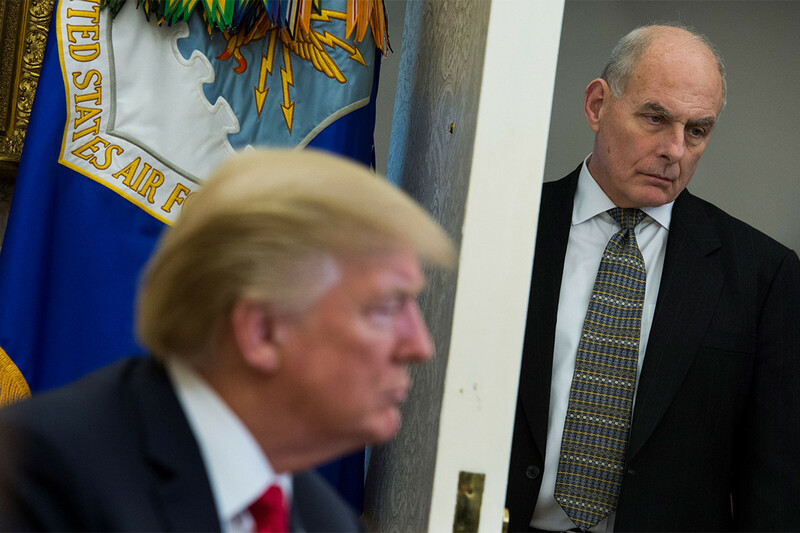 For all of Trump’s frustrations with his chief of staff, Kelly often seemed equally discontented. He reportedly called it the “worst job I’ve ever had,” and aides said he sometimes seemed disengaged in recent months. Kelly was installed in the chief of staff position by presidential tweet in July 2017 after Reince Priebus was pushed out. Despite frequent stories about tension with the president, Kelly lasted for a year and a half, exceeding the expectations of many in the White House. “While it got rocky at times, he kept the government on the tracks more than people realize or he’ll get credit for achieving or preventing,” said Blain Rethmeier, a former Republican official who advised Kelly during his DHS confirmation process. Kelly, a retired four-star Marine general, initially won Trump over during a brief stint leading the Department of Homeland Security. As DHS chief, Kelly eagerly pushed forward with policies aimed at helping the president reach his goal of curbing illegal immigration, and he remained by Trump’s side during the messy roll-out of the president’s first travel ban. Initially, Kelly was hailed in the White House as a disciplinarian who could bring order to a chaotic West Wing. He cracked down on visitors wandering in and out of the Oval Office and instituted a review system of sorts to control the flow of documents crossing the president’s desk. Though he attempted to avoid the spotlight in his role, Kelly came under fire in February for his forceful defense of Trump’s staff secretary Rob Porter in the wake of allegations of domestic abuse from two of Porter’s former wives. Kelly initially denied knowing about the allegations and said that Porter would remain in his job. He later said that he was unaware of the scope of the accusations until he saw photos, and Porter soon left the White House. The incident irked White House communications staffers, who felt they were left to suss out what actually happened on their own. Tensions spilled out into the open again this spring, when NBC News reported that Kelly privately referred to the president as an “idiot.” Kelly was forced to issue a denial, calling the report “total BS.” That report was later backed up by a White House exposé written by veteran reporter Bob Woodward. But Kelly did reportedly find a niche as the president’s tough talker. Despite gaining national acclaim for firing people on “The Apprentice,” Trump has recoiled from having some tough in-person conversations — including firing officials. Instead, Kelly often assumed that role. It was Kelly who had bombastic communications director Anthony Scaramucci removed after just 11 days. Kelly also fired former aide Omarosa Manigault-Newman, according to a secret recording she made, and Kelly revealed to reporters that he fired Trump’s first Secretary of State Rex Tillerson while the latter was in the bathroom. With Kelly out at the White House, the future of his replacement at DHS has also been thrown into question. Secretary Kirstjen Nielsen got the job with Kelly’s backing after she served as his chief of staff at DHS and as his deputy in the West Wing. Nielsen spent several weeks in November fending off rumors of her imminent departure, as well as public criticism from Trump that she was not aggressive enough in pushing a restrictive immigration agenda. But Nielsen has adopted a hardline tone regarding the migrant caravan camped out on the Mexican side of the U.S. border, easing Trump’s concerns. Daniel Lippman contributed to this report.